With his ear getting better and better I guess you can expect ... that he'll be feeling even more of the friskies! Tuesy loves ripping apart cardboard boxes - have you introduced Kitty to cardboard? Maybe he'd latch onto that instead of valuables? Sounds like you've come to a decision about names? His name is Haboob! It fits him perfectly. Haboob? I thought his name was George! He is a cutey, even if naughty! A haboob is a very powerful dust storm in case anyone was wondering. That's what he is when he runs around the house. I just see a beige/brown blur! And he terrorizes the other kitties. He is definitely a haboob rather than a dust devil! I've given him various Amazon boxes to chew on but he's not interested in them yet. He likes toys he can bat around and chase. 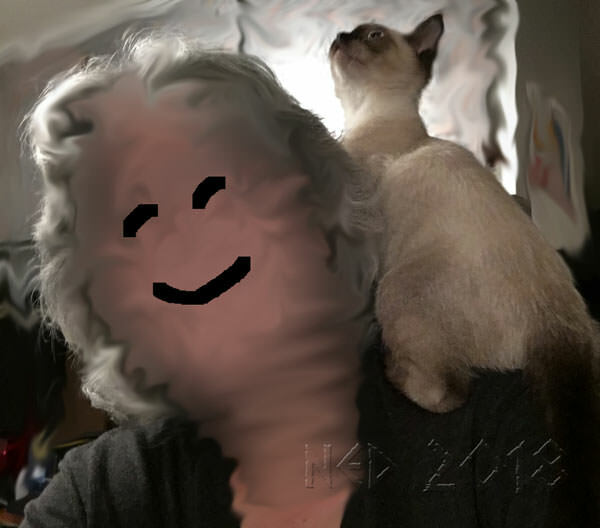 Shoulder cat! He has grown a bit and put on weight. I have noticed he has a problem with his right rear leg. It seems weaker than the left. When he walks or sits he leans too far to the right and sometimes he falls over. We have an appointment at the vet tomorrow so I'll will bring that up to the vet. He is very active though, running and attacking the other cats. Smoggy doesn't like that but Stormy will wrestle with him until she's had enough of his shenanigans. I'm still putting him in the kennel at night mainly to give the cats a break from him and also to get him to eat his kitten food without the other cats getting into it. He loves wet food thank goodness. He is big enough now to be neutered and I hope that will settle him down a bit and he will get along better with Stormy and Smoggy. It's hard to believe I was worried about his safety being so small! He is a holy terror and can take care of himself even being so tiny. Cuuuute!! He looks so pleased with himself too! Haboob now weighs 4.3lbs! He will be neutered on Wednesday (yay!). Unfortunately it was just a tech appointment and the doctor wasn't there so I couldn't ask about his leg. He got his FVRCP and Rabies. I saw Ginny and Ron (now Bonnie and Clyde) and their owner brought them over so Haboob could say goodbye. Just the neutering to get through and he will officially be mine. Make sure you tell them about the leg before his surgery. They can xray it while he is under anesthesia. His neuter went fine and now he's home. I asked if he needed any special litter and they said no so I just let him use the litter box as normal. Unfortunately, he decided to lie down in it and got some litter on his incisions! I used a washcloth to lightly try and get the litter off and I think I irritated the incision. I'm worried he will get an infection now. Is there anything I can do to clean it or should I let him lick it a few times to clean it? Or just leave it alone? And this instruction to keep him calm and quiet - yeah that's not working. He is running and playing with Smoggy and not being calm at all. I tried putting him in his kennel and he got very upset and was desperately trying to claw his way out. This is more stressful than I had anticipated. Thanks leslie, I'll pick some of that up today. Last night after this happened I went and got some yesterday's news and set up a litter tray for him in my bedroom. I locked the other kitties out so it was just me and him and as far as I know he slept most of the night. They look ok this morning, just a little red and slight ooze on them. He hasn't been licking so I don't think they are bothering him. He is on a little Buprenex for pain. He is acting his normal frisky self. I'll try and post a picture later if I can get one!